Capoeira is an art form that defies description. It is a fight, it is dance, a game. It is creativity, intuition, grace, strength, history and tradition. To understand the movement, music, and magnetism of Capoeira, we must explore the art's fascinating tradition and mysterious history. Capoeira is a story of triumph and freedom. Rooted in the rich cultures brought to Brazil by enslaved Africans, Capoeira's history, is a subject of much debate. Capoeira’s history and its legends were passed down orally from former slaves who passed the art to their students. It is teachings of these old masters and a few surviving documents that tell the story of this singular art. Capoeira's origin dates back about 500 years to the beginnings of Brazil's slave trade period. Throughout the 488 years of slave trade in Brazil, various tribes from West and Central Africa met and intermingled in the senzalas (slave quarters) and in the quilombos (escape slave nations). From this mix of African cultures came a melding of traditions, rituals, rites of passage, food, dance, language and religion. Slowly, a new Afro-Brazilian identity with a distinct set of cultural practices was born. With this new identity came the development of Capoeira, a practice that would years later be referred to as the art of liberation. Capoeira and its practitioners persevered through centuries of marginalization and discrimination and today the art has evolved from cultural practice, to martial art to way of life. This once outlawed, clandestine art of physical and spiritual empowerment, has transformed itself into a staple of Brazilian popular culture and today is recognized as a national sport. The 20th century saw the rise of many legendary mestres (masters) that would change the face of the art. These dedicated capoeiristas (practitioners of Capoeira) worked tirelessly to bring Capoeira out of the shadows and into mainstream Brazilian culture and later onto the global stage. In the late 1920s, a man by the name of Manuel dos Reis Machado AKA Mestre Bimba began to develop a new and more objective Capoeira training method. In his home state of Bahia in the Northeast of Brazil, Mestre Bimba was a well-know pugilist. He was a practitioner of Capoeira and other martial arts. He believed that Capoeira had become too folkloric and dance-like, he felt its training method was unorganized and needed refining in order to attract more students. With the help of a small group of his students, he began to develop a new and more objective training style. Mestre Bimba created eight partner sequences and used his own distinct rhythms on the berimbau, Capoeira’s lead instrument. Mestre Bimba’s signature training style would later be dubbed, Capoeira Regional. The importance of Mestre Bimba’s work went beyond a new training style, he helped illustrate the physical benefits of Capoeira and show how effective it was as a martial art. He and his best students toured Brazil, challenging and fighting the most famous martial artists of the day. Mestre Bimba was pivotal in helping to legitimize Capoeira and popularized the art form. Because of his work, in 1937, Capoeira was taken out of the penal code and recognized by Brazil’s then president, Getúlio Vargas, as a national sport. After Mestre Bimba began developing Capoeira Regional, another important capoeirista, Mestre Pastinha, began to organize what is today referred to as Capoeira Angola, the original style of the art. Mestre Pastinha, (Vincente Ferreira Pastinha) saw the need to underscore the African roots of the art, and continue teaching it in its original form. Similar to Mestre Bimba, Mestre Pastinha began to organize Capoeira Angola, preserving the teachings of old masters and former slaves. Capoeira has undergone considerable development and evolution in its training, organization and practice. Today, there are two equally important styles of Capoeira: Angola and Regional. The majority of Capoeira schools today practice both, recognizing the importance of each and understanding that Angola and Regional possess a symbiotic relationship. Schools that follow the tradition of practicing both often refer to their style as Capoeira Contemporânea - contemporary Capoeira. 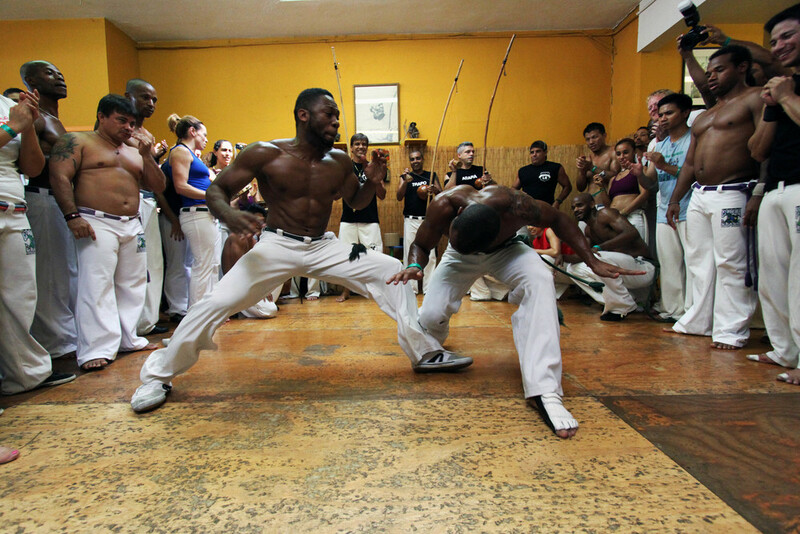 The game of Capoeira is a fluid series of agile, acrobatic, and martial movements linked together to form a unique corporal conversation. The gracefully strategic physical dialogue happens in the Roda, the circle where training manifests into games between two Capoeiristas (practitioners of the art). These games are an intricate exchange of circular and straight kicks, escapes, sweeps, takedowns, and gymnastic flourishes. The spirit and energy of a Capoeira Roda is contagious. The art form combines circular and straight kicks, acrobatics, takedowns and creativity with mesmerizing music and universal spirituality. Capoeira brings health and balance to the life of its participants, whatever their age. The martial art is ideal for building awareness of body and mind, teaching fast reflexes and self-defense tactics. Capoeira is graceful and challenging, a life-tool encouraging all those who train to grow and invest in physical as well as mental well being. For those who have never seen Capoeira played, the roda (circle) is where everything happens. It is the climax of the art of Capoeira. At the head of the roda is the orchestra consisting of three berimbaus, two pandeiros and one atabaque. The berimbau is a mono-chord instrument whose primitive form originated in Central Africa. It dictates the flavor and speed of the Capoeira game inside the roda. This lead instrument can play over 10 different traditional rhythms with countless variations. The berimbau's unique acoustic sound is accompanied by the atabaque, a drum much like a primitive conga. The atabaque is the heartbeat of the Capoeira roda and is accentuated by the pandeiro (tambourine). The Capoeira orchestra is completed by the chorus, the ring of voices echoing from the roda in a call and response style song lead by one of the Capoeiristas. Capoeira songs tell of the art's powerful history, stories of legendary mestres, and of playful anecdotes. These stories, true and legendary alike, are colorful, inspiring, funny, and sometimes sad. Above all, Capoeira songs illuminate the intensity and vision of the art. Songs are sung in poetic, rhythmic Portuguese, Capoeiristas of all nationalities and ethnicities are inspired to learn the language.